Stories To Tell is in the business of helping people to tell their stories. So, I’m always interested when I see something new in the world of storytelling. I want to pass on two innovative attempts to use the tools of new technologies to tell stories both of which arrived in my in-box today. Each is interesting. See what you think. 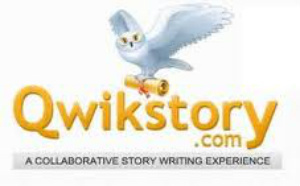 The first is Qwikstory which was featured in a post on Mashable, the internet news blog that bills itself as Social Media News and Web Tips, titled Quikstory Puts a Creative Social Spin on Storytelling. Qwikstory.com is a new social media site where people come together to create and write a story about a particular topic (or no topic at all). Here's the catch - once you start a story, you have only 1,000 characters to tell your part of the story and you can't continue the story until at least one person has added to your Qwikstory. I learned about the second new tool on Twitter, where one of our new followers, Seattle Tales, sent us a message inquiring, “Are you in the "emotobooks" Revolution, too? gritcitypublications.com.” I wasn’t so I checked it out. Post a comment and let us know what you think of these new approaches to storytelling.